Friday Wrap-Up – News and Brews from YellowBelly, Picaroons, PEILCC, The Coast, Pump House, Big Spruce, and much more! Good morning, beer lovers! We hope everyone had a great week… how about some local beer news to lead you into the weekend, and a St. Patrick’s Day Monday? • The YellowBelly Brewery and Public House has re-released their Paddy’s Pale Ale. This 6.2% ABV beer is actually a Rye IPA; brewed with rye malt, Carastan, Munich, and a large percentage of Canadian Pale Ale malt, it is hopped with Galena and Cluster varieties – including two dry-hop additions – to about 60 IBUs. Described by Brewmaster Liam McKenna as having a very fruity aroma, slight peppery rye character in the taste, and a bitter finish, it’s on tap now; bottle availability is still up in the air. • Picaroons is planning a tap takeover at Plan b Lounge in Moncton on Friday evening, March 28th. All of the taps will feature Picaroons beers, one of which should include a special dry-hopped version of their Yippee IPA. Gravity Strike will also provide live music. Just a reminder, too, that the sold-out Picaroons tap takeover at Stillwell is tomorrow, March 15th; more info on that event in our previous post. • While on the topic of Picaroons, they’re holding a special event at the Saint John Ale House on Saturday, March 22nd. “Maple Mania” starts at 6:30 pm, and features a multiple-course, maple-infused dinner from chef Jesse Vergen (who also took part in Top Chef Canada). There will also be live traditional fiddle music, followed by other entertainment. Of course, there will also be Picaroons Maple Cream Ale pouring… on cask! Tickets are $60 (price includes at least one beer) and can be purchased at the Saint John Ale House; there are a limited number available, and the event is close to sold out. • For those of you living in PEI, there’s some good – albeit, odd – news if you’re looking for bottled beer after the PEILCC has closed their doors for the evening. CBC News reports that restaurants on the Island are now allowed to sell takeaway PEI-brewed beer (after they’ve applied for the appropriate licence, of course), up to 12 bottles per person (or two bottles of wine or spirits). The catch? Well, you have to actually “purchase and consume a full-course meal” before you can take away the beer. Whether this means you have to clean your plate, we’re not sure! And we won’t even get into the whole “Is soup a meal?” argument. Hours of sale are restricted from 9 am to midnight. • The Coast is currently conducting their annual Best of Halifax awards, where readers get to vote for their favorite eating and drinking establishments in Halifax, and more. Make sure you check out the online survey, and vote for your favorite beer-related categories, such as Best Brew Pub, Best Craft Brewery, Best Beer Selection, etc. • Speaking of The Coast, they’ve just released their annual Beer Guide Edition, highlighting the important place beer plays in the city’s identity. Look for great articles about learning to drink and enjoy beer (hint, try many styles and brewers before deciding you don’t like a certain type of beer), Stillwell Beer Bar, the continued rise of women in the beer industry, a breastfeeding mother’s search for new beers, and much more. • The Pump House Brewery is getting ready to release their seasonal Maple Ale again. Brewer Scott MacLeod says that this year’s batch is very smooth, and a bit less sweet than last year’s; it has an ABV of 5%. All of the maple syrup used in the brew was locally-sourced, from Maritime maple sugar camps. It will be available on tap at the brew pub location, and will be available in bottles across New Brunswick and Nova Scotia, within the next two weeks. • Nyanza Cape Breton’s Big Spruce has brewed up a Scotch Ale to celebrate their first anniversary. Brewmaster Jeremy White has designed it to be a true Scotch Ale, hopped to about 26 IBU with Goldings, with lots of Roast Barley goodness on the palate. From Jeremy, “We intend to cask as much of it as possible, and age/fortify it with Glenora single malt. All Cape Breton, all local.” Once we have details on the beer’s release, we’ll be sure to pass it along. • Yesterday, Propeller Brewing Company released their newest seasonal beer, Irish Red Ale. Weighing in at 5% ABV, and hopped with Willamette, the beer is meant as “a tribute to the classic red ales of Ireland”, according to new Brewmaster Josh Adler. It is available now in 650mL bottles and growlers at both Propeller locations, and as well as the private stores. It will also be on tap around Nova Scotia. • A reminder that the Ladies Beer League will be brewing with Emily Tipton at Boxing Rock tomorrow, taking part in the International Women’s Collaboration Brew Day. They’ll be brewing up the “Alewife’s Revenge”, their take on the Unite Pale Ale, featuring local cranberries. The fruits of their labours will be available beginning April 17th in growlers and bottles at the brewery and markets, and in bottles at the private stores, along with a few kegs around the province. The charities benefitting from a portion of the sales will be the Pink Boots Society and Shelburne County Women’s FishNet. The FishNet is a non-profit support network for Shelburne County women, seniors and youth. Its mission is to support women and their families in reaching their full potential as community citizens. 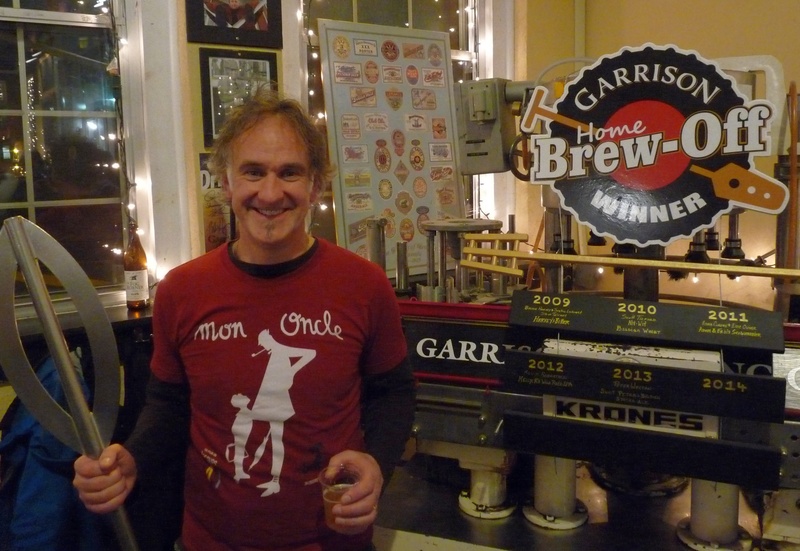 • Last, and certainly not least, the gala for the Garrison Brewing Home Brew-Off was held last night at the brewery. 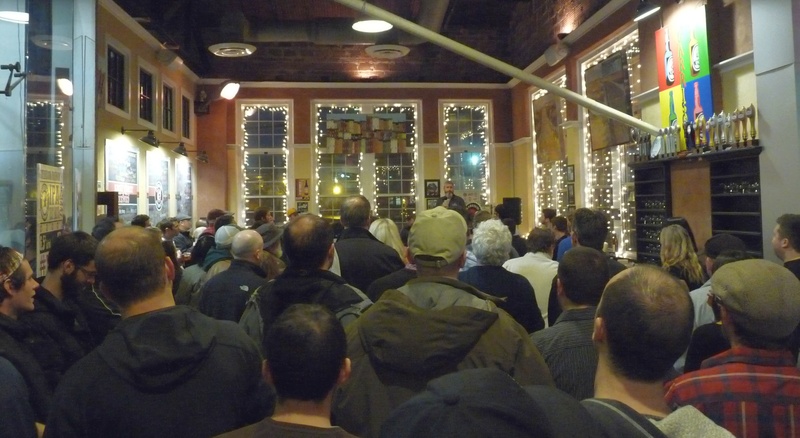 There was a great turn-out for the event, that saw 76 different Weizen’s vie for the title of best in show. This year’s winner was Jason McDougall of Halifax, congratulations! This homebrewer has been brewing for more than ten years, but this was the first time brewing a Weizen (and also the first time entering a contest!). 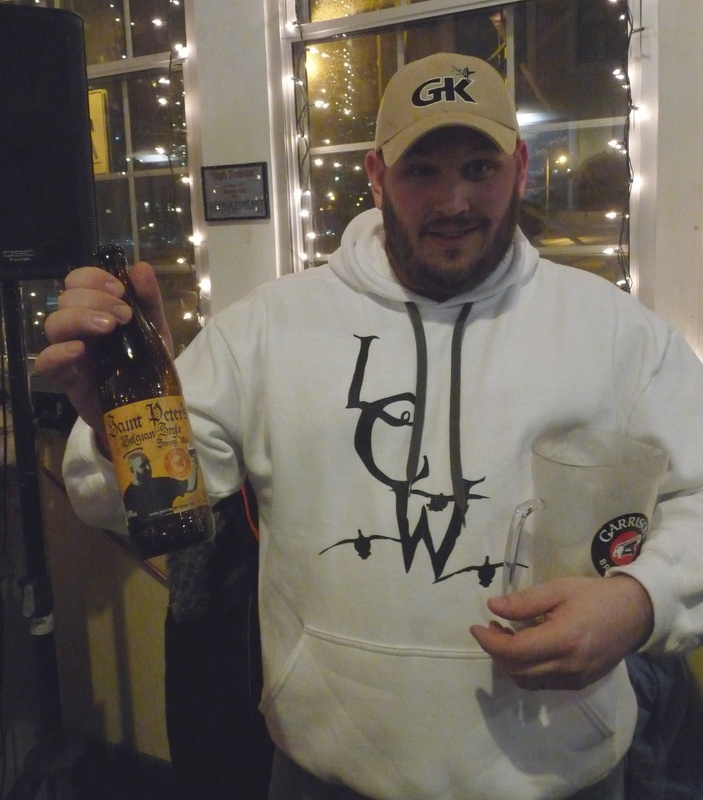 Chris had a chance to try the winning beer, and it was certainly worthy! All of the four finalists’ beers were great, and Kirsten & Keely, Roger, and Ed were very deserving of their Final Four placement. One noted absence was the winning beer from 2013’s Home Brew-Off. Unfortunately, while winning brewer Peter Welton was in attendance, his Saint Peter’s Belgian-Style Strong Ale was not quite ready for primetime. As Brian and Daniel said at the festivities, you cannot rush a beer, so they decided to let the fermentation and conditioning finish in due time. 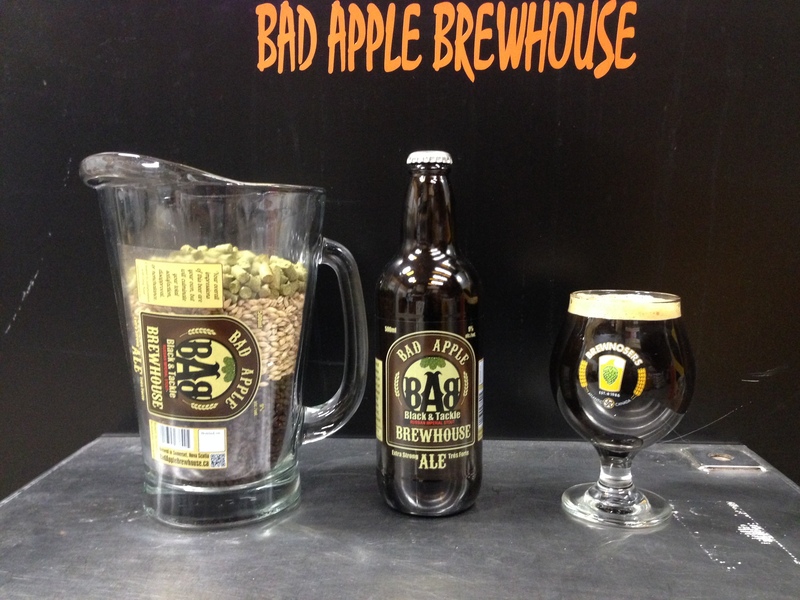 Look for this 7.5% ABV Blonde to hit stores and bars late next week. Brian also spilled the beans that they will be doing their first brews at their new location across the street next week. This 30hL brewhouse will effectively triple their production, and allow for continued expansion across the country. We’ll have more details soon. • A late addition to the blog: The winners of the “Best of the Fest” for the 2014 Fredericton Craft Beer Festival have been announced. Several hundred ballots were cast electronically after the fest, and the favourite Breweries of the Fest were Le Naufrageur (Carleton-sur-mer, Quebec), Boxing Rock Brewing (Shelburne, NS), and Bad Apple Brewhouse (Somerset, NS). Congratulations to the winners, and all breweries in attendance! Have a great weekend, and a great St. Paddy’s Day! Remember, say “no” to died-green beer, and celebrate the holiday by drinking some good, local craft beer!